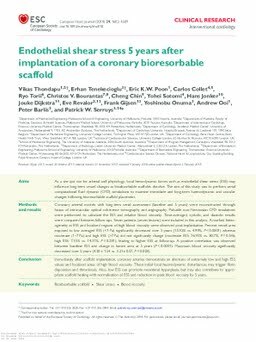 Aims As a sine qua non for arterial wall physiology, local hemodynamic forces such as endothelial shear stress (ESS) may influence long-term vessel changes as bioabsorbable scaffolds dissolve. The aim of this study was to perform serial computational fluid dynamic (CFD) simulations to examine immediate and long-term haemodynamic and vascular changes following bioresorbable scaffold placement. Methods and results Coronary arterial models with long-term serial assessment (baseline and 5 years) were reconstructed through fusion of intravascular optical coherence tomography and angiography. Pulsatile non-Newtonian CFD simulations were performed to calculate the ESS and relative blood viscosity. Time-averaged, systolic, and diastolic results were compared between follow-ups. Seven patients (seven lesions) were included in this analysis. A marked heterogeneity in ESS and localised regions of high blood viscosity were observed post-implantation. Percent vessel area exposed to low averaged ESS (<1 Pa) significantly decreased over 5 years (15.92% vs. 4.99%, P < 0.0001) whereas moderate (1-7 Pa) and high ESS (>7 Pa) did not significantly change (moderate ESS: 76.93% vs. 80.7%, P = 0.546; high ESS: 7.15% vs. 14.31%, P = 0.281), leading to higher ESS at follow-up. A positive correlation was observed between baseline ESS and change in lumen area at 5 years (P < 0.0001). Maximum blood viscosity significantly decreased over 5 years (4.30 ± 1.54 vs. 3.21± 0.57, P = 0.028). Conclusion Immediately after scaffold implantation, coronary arteries demonstrate an alternans of extremely low and high ESS values and localized areas of high blood viscosity. These initial local haemodynamic disturbances may trigger fibrin deposition and thrombosis. Also, low ESS can promote neointimal hyperplasia, but may also contribute to appropriate scaffold healing with normalisation of ESS and reduction in peak blood viscosity by 5 years.